Since your audience, prospect, or customer appears attentive while they’re politely listening to your every word, and being courteous about it, that doesn’t necessarily mean you’re captivating them. During your Sales Presentation, it’s recommended that you inject variables to keeps things interesting, never be stagnant or repetitive, and don’t use the same “canned” sales pitch every time you make a presentation. So there you are, making one of your most important marketing pitches of the week. You’re desperately wanting to make an impression, turning those prospects into clients. 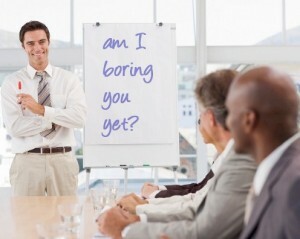 And yes, they’re listening intently, captivated by your spiel, nodding in unison and on cue. They’re also asking you questions, jotting down notes, so it appears that you have an audience that’s on the same track you are. But are they really being genuine, or is it just for courtesy sake, a facade. In their minds, they may be completely bored of your tone of voice and repetition, daydreaming about their tight schedules, mentally making a list of the things they need to do, or just counting away the minutes until the presentation ends. Truth be told, you’re most likely doing yourself a disservice by speaking about issues which are completely irrelevant to your prospect. Some will gratefully state the bluntness and offer mercy by asking you to get to the point, while the majority will be polite enough and grant you the courtesy of pretending to listen, while giving you that glazed over stare. So don’t be boring, don’t use the same “canned” presentation each and every time by learning how to adapt to your audience. The following are some tips from a customers point of view to what they don’t want to hear. No one really cares about your company other than you. So take no more that 2 or 3 minutes tops to list and summarize all of your company highlights, then beyond that, you’ve lost them. You’re just talking to yourself and your customer no longer cares. Keep in mind that people will usually talk about what they’re interested in. So if you can connect the history of your company to the conversation, then do so, but make sure it’s quick and interesting. Whether you’re listing off all your locations, the awards which your company won, or you’re talking just about you… Well, stop doing so, or keep it as short as possible. If your prepared sales presentation also details the equipment that your company owns, or you list the entire inventory of what your business has, such as the production specifications and the capabilities of the machinery, you will instantly put them to sleep. If you’re presenting to technical buyers, you could then include the specifications on a brochure for them to review later, but don’t bother presenting that data unless they specifically ask for it. There’s always that one person, however, the tech guy in the room who may be interested, but you’ll lose the interest of everyone else. The prospect may be interested in your background since you are the person that they’ll be ultimately dealing with. But generally, names along with your unsubstantiated experience is completely irrelevant to them. Most wonder why the majority of sales and marketing presentations are so intent on making themselves unique from others. Why do you as a presenter differentiate yourself so much from all of your competitors. But you may be wondering, isn’t the whole point of your conversation and your presentation about convincing your audience how different, unique, or better you are from everyone else. What your “Unique Value Proposition” always seems to be focused on is you. But what your potential customers are wanting to know is how it’s relevant to them, or for their business, and their issues. Without the proper translation or resolve, they will quickly begin losing interest in you, hoping that the meeting will end soon. There are a few things which you can do to get off on the right foot, by giving them what they actually want to hear. There are a few techniques that you can implement for better engagement. What you should be asking yourself is, “What’s the one single most important issue that you could get out of the meeting today?” Knowing what that is takes out all the variables as well as the guesswork, while setting the stage for better conversation that’s completely focused on the client. You can begin by stating to your audience, “In today’s presentation, what we’ll focus on is the single (one or two) issue(s) which is the most relevant for us working together.” Then list them. Begin with the end result in mind, always be closing. The final expectation for the meeting may be they making a decision, or a written or verbal agreement for future exploration, or some other resolve. What this does is it sets the expectation, which can include seeking an agreement from the attendees. Then make sure that you end the meeting with revisiting that initial outcome request.